The shape of organizations in the future will depend in large part on how we as individuals take control, steer our own lives and interact and communicate with others in the workplace. For the last few years I have seen many people, salaried and inside organizations, showing signs of attitudes and behavior similar to external freelancers. I use the term “gig mindset” to describe this phenomenon and decided to explore it further. Is it just a question of nuance, of degree, or are there real, meaningful differences? What does it mean for people and their individual development? What impact does the gig mindset have on organizations? Does it build resilience, and trigger innovation? Does it create disorder and increase risk? The “gig mindset” research is based on eight behaviors (see figure below). 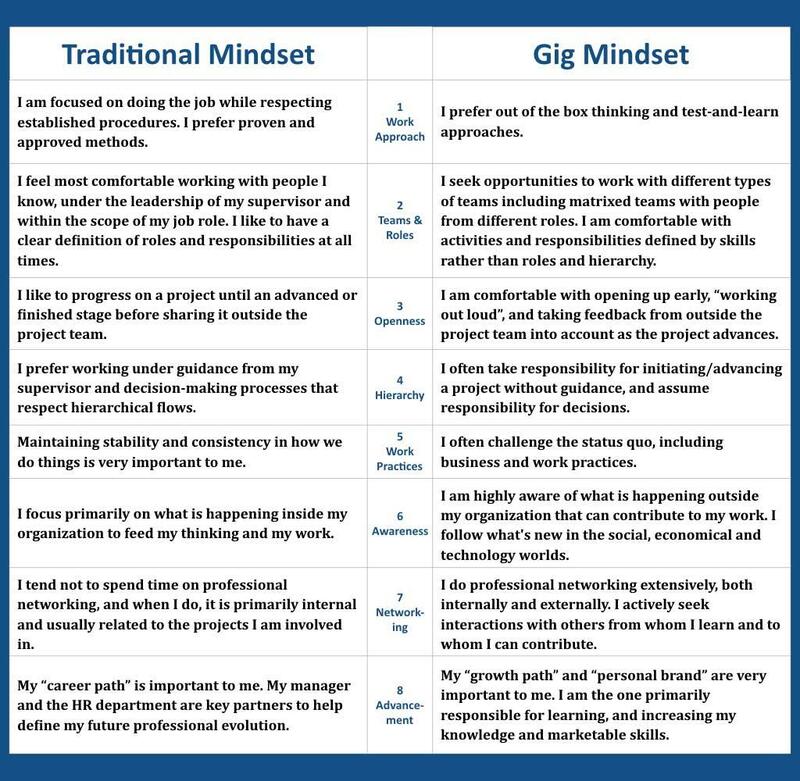 The traditional mindset and the gig mindset are posed as opposites on the table, but in reality, people find themselves at different points along the spectrum, and individual people see themselves at multiple points on the spectrum depending on context and circumstances. The eight behaviors were defined with the help of my Advisory Board. The first phase of the research was a short online survey involving 297 people around the world who feel an affinity to the gig mindset as we defined. The second, ongoing phase involves a series of interviews and focus groups in Asia, Australia, Europe and North America. The survey data show that older workers are more likely to have a gig mindset approach to work whereas the younger age groups self-assessed at the lowest level in the survey population. Unsurprisingly, the younger workers rate themselves significantly lower on behavior 4: assuming responsibility outside of hierarchical systems. This could mean that the least experienced people try harder to “fit in”, while more experienced people feel freer to act as they think best. Older workers are more likely to seek opportunities to work with different types of teams and with people from different roles. They are more comfortable with activities and responsibilities defined by skills rather than roles and hierarchy. They can help younger workers acquire more flexibility by making sure teams have diversity in age. On the other hand, younger workers are more likely to be comfortable opening up early by “working out loud”, and taking feedback from outside the project team into account in early stages of a project. By involving older workers in their working out loud practices, they can help them experience firsthand the benefits of open sharing. Most people in the survey, regardless of age, agree that advancement via a personal growth path is more important than a career path. However, the older workers have realized that networking is a lever for personal growth more than have the younger workers. Inviting them into their networks can be mutually beneficial. “Gig-mindset people are like early adopters. There are not many today, but their numbers will grow gradually”. Better inspire and attract talent. Build a stronger network, inside and especially outside the organization, thereby getting to know customers better. Have a stronger capacity of creativity and innovation, bringing evolution of products and services to customers. Be a game changer in their area of activity. Answers to this fundamental question are emerging through interviews and real life examples from survey participants. Future posts will focus on how to facilitate a gig mindset from both individual and organizational viewpoints. 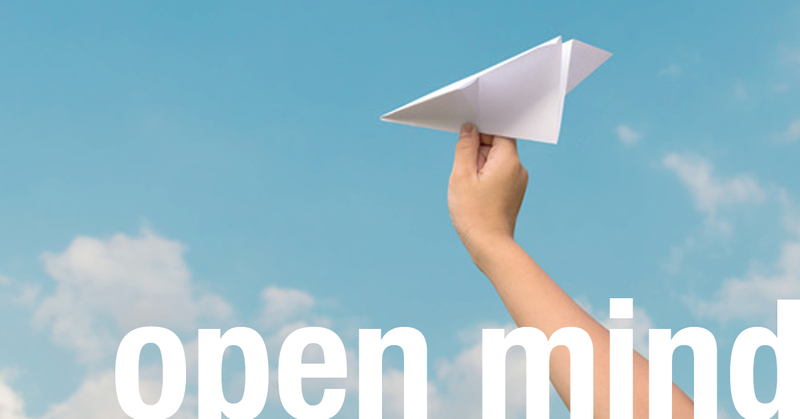 Please get in touch if you would like to be interviewed about the gig mindset, sharing how you perceive it in yourself and people around you, and how think it will shape organizations in the future. Jane McConnell, independent advisor and researcher (Netjmc) has conducted extensive research for 10 years with over 300 organizations around the world in annual surveys on “The Organization in the Digital Age”. Her foundational framework has been used by many organizations to help define their internal digital strategies. The 2016 report was included in Boston University’s “Leading in the Digital Age”, edX course. In addition, she has worked as a digital strategy advisor with large global organizations in Europe and North America for 18 years.